Treasury Secretary Steve Mnuchin's latest FakeDenial of his attempt to live a Carly Simon moment with his trophy wife comes with a slap at Middle America. Treasury Secretary Steven Mnuchin is wrapped up in a growing controversy over his use of a government plane to travel to Fort Knox during last month's solar eclipse and his request to use one for his European honeymoon this summer. 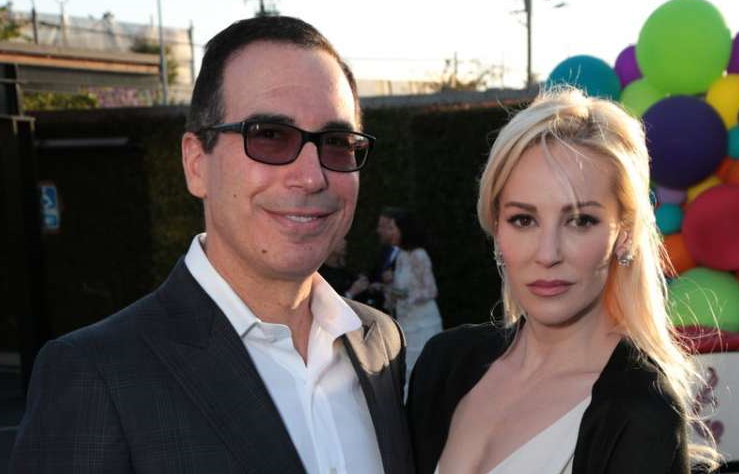 Mnuchin has denied that he used the government plane for the purpose of seeing the eclipse from Fort Knox with his wife; he said there was official government business at hand. So it's understandable that he would downplay his interest in the phenomenon. But it's hard to read his comments as anything but demeaning to the people of flyover country. Those people were interested in the natural phenomenon, he seemed to be saying, but as a metropolitan man who has lived on both coasts, it just wasn't that interesting to me. For the record, here in metropolitan San Francisco, the streets were crowded with people viewing the eclipse. Including business executives outside the high-rent Transamerica building. I never had a clue what this guy was like personality wise until I saw a video of him at a hearing. You can tell instantly he is a buffoon that is just outgoing enough to squirm his way out of (and probably into) anything.